Aurora, OH – More states, schools, and teachers are being held accountable for poor readers, but no one is being held accountable for whether or not students have the visual skills necessary for reading and learning. As another school year winds down, more children are being left behind. More children continue to struggle with reading fluency (the ability to read text rapidly, smoothly, effortlessly, and automatically) and comprehension (the ability to understand the meaning or importance of what they’ve read). 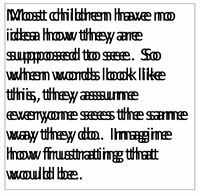 When someone has difficulty seeing the print in a book due to any of a variety of correctable vision disorders, reading fluency suffers. 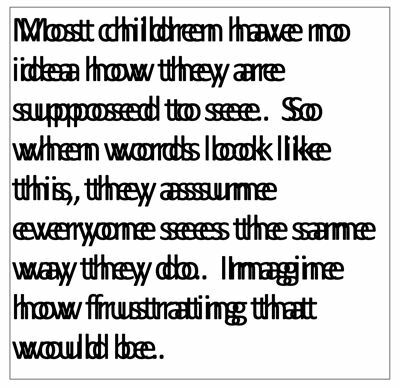 When a child is not able to follow along a line of print (eye tracking), or his two eyes don’t work together properly (binocular vision disorder), it is very difficult to read fluently. Many children can pass school vision screenings or vision screenings at the pediatrician’s office but still have one or more of a variety of vision disorders that impacts how their two eyes work together when they read. This is because vision screenings are not designed to test all 17 visual skills that are necessary for success in school. Typically vision screenings only test for visual acuity (how clearly letters can be seen from a distance of 20 feet away) which is only one of these 17 visual skills. While some pediatricians may tell parents that vision has nothing to do with reading, their national licensing board, the National Board of Medical Examiners, uses optometrists as their consultants on visual disabilities, because they have seen how disabling these visual conditions can be during academic activities such as reading, working on a computer, or taking tests. Fortunately, the majority of these vision disorders are very treatable. The College of Optometrists in Vision Development is hoping that educators and parents will pay special attention to this year’s August is National Children’s Vision and Learning Month campaign. To launch their 2012 campaign, a series of public service announcements (PSAs) were released today to help raise awareness that vision problems can not only interfere with learning, but sports performance, and other activities of daily living. These PSAs also address vision problems that impact individuals who have autism spectrum disorders or those who have suffered a head injury. The PSAs can be downloaded from COVD’s website, www.covd.org.